Snippets of Jack: "Death lies before us, as we sail...for the Fountain of Youth." "Death lies before us, as we sail...for the Fountain of Youth." Well; Jack escaped from prison and the noose again. But soon after, he finds out that some one is impersonating him. That someone happens to be his long lost love Angelica (who he betrayed and is mad a him of course), who just happens to be the supposed daughter of "Blackbeard. Edward Teach. The pirate all pirates fear. Resurrector of the dead in his spare time." So Jack decides to tag along with her, and try to steal Blackbeard's ship via mutiny. But of course he fails, and is imprisoned. "You...are a ruthless, soulless, crossgrained cur." "I told you I had a ship." "No, Blackbeard has a ship. Upon which I am now imprisoned." But Jack has a secret. He "knows" where the "fountain of youth" is. And since Blackbeard is dying he agrees to let Jack lead him and his crew to the fountain. Angelica: I am starting to think you don't know where you are going." 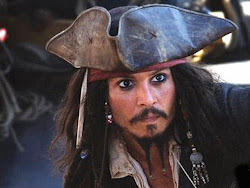 Captain Jack Sparrow: Its not the destination so much as the journey"
But they begin to have some doubts about Jack. So they test him, by throwing him off a cliff. "Oi. 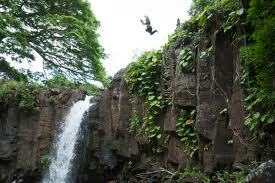 If I jump, will I survive?" "...The doll. [Angelica gives him the doll, and the Quartermaster throws it and Jack screams as it falls] ...Yes, now you will survive." "This is nonsense! I'm going!" Of course he survives, so they are back on their quest. And soon after they discover the Fountain! But just before Blackbeard drinks the water and tear, the Spaniards barge in and destroy everything, but Jack Saves the chalices that hold the Water of life and tricks Angelica into drinking the water, and the dreaded pirate Blackbeard died. Unfortunately Angelica wanted her "father" to survive and is terribly angry with Jack tries to strand him on an island. But Jack prevails and chooses his love for the sea over he beloved Angelica. "Admit it, Jack. You still love me." "If you had a sister and a dog...I'd choose the dog." "Treasure! There is a chest with jewels! Jewels with the power to rule the wind and tide!" "You're making that up.""Wait. I am with child...Yours." "I don't recall that we ever had—" "You were drunk!" "I've actually never been that drunk." "Wait. There's something I want to say to you. Something I wanted to say from the moment we first met." "...Go on then. ""I love you." "...As do I. Always have, always will. [leans in close to kiss Angelica]...I gotta go." "So the Pearl. Any idea on how to get her out?" "We shall need a crossbow, an hourglass, three goats, one of us must learn to play the trumpet, whilst the other one goes like this. [waves his fingers]" "I know a man with a goat." "Good, I can go like this. [waves his fingers]"